"I'm not Haitian, but it just hurts to see that," John Restituyo says of the damaged presidential palace. (CNN) -- The devastation was worse than he imagined. At 5 a.m. Wednesday, John Restituyo began preparing to fly to Haiti. He had heard the night before that there had been an earthquake in Santo Domingo, Dominican Republic, but in Punta Cana, far to the east, he hadn't felt a thing. He turned on the news, and then he saw what the fuss was all about. 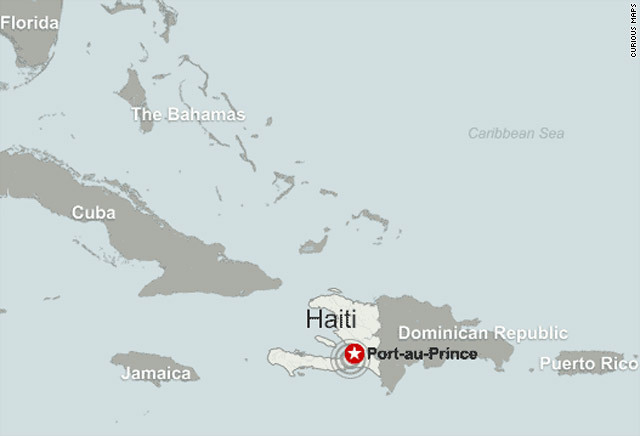 The tremors that shook Santo Domingo came from a 7.0-magnitude earthquake that rocked Haiti. He was shocked, he said, that the nation that shares an island with his country had endured such a powerful quake. But nothing was more surprising than what he saw from his helicopter later Wednesday. "It's a complete disaster; like nothing I've ever seen," Restituyo said. "The streets are very chaotic, as far as what I can see from the sky. ... I can definitely see a lot of houses that came down, a lot of roofs that caved in. People just -- people look like they have nowhere to go. They are in groups everywhere. You can see them." Restituyo, a pilot for Aero Ambulancia, a private medical air transport company -- the first in the Dominican Republic -- made two runs to the impoverished nation Wednesday, the first to drop off Puerto Rican National Guard medics. He flew 45 minutes to Santo Domingo, the Dominican capital, and then 90 minutes to Port-au-Prince, Haiti's capital. From there, he flew 35 minutes to Barahona, back in the Dominican Republic, for supplies, which he then took to Port-au-Prince. He said he expects to have made four round trips by Thursday. 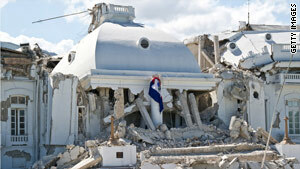 Aid missions to Haiti in the wake of natural disasters is not new work for Restituyo. When hurricanes ravaged the country in 2008, killing hundreds, he also went airborne into Haiti with supplies. Despite his veteran status, he said, it's hard for him to shake the feeling that this disaster is different. "The presidential palace, the roof caved in," he said. "It sends chills up my spine. I'm so used to going to Port-au-Prince, and the palace is so beautiful. And I'm not Haitian, but it just hurts to see that." Many thousand people are feared dead, and survivors will be in desperate need. Restituyo said he expects that quake victims will need plenty of canned goods, fresh water and other supplies in the coming days. He estimated that 25 publicly and privately operated helicopters from the Dominican Republic were providing support to Haiti, a majority of the helicopters in the country. Other countries and international aid groups are also rushing aid to Haiti or have allocated funds to the efforts, including a promise from the World Bank of $100 million for recovery and reconstruction. Aero Ambulancia has been "flooded with calls," Restituyo said, but he and his fellow pilots can only do so much. They have four aircraft flying into Haiti and may bump it up to six Thursday, he said. The parent company of Aero Ambulancia, which runs charter flights, owns 10 helicopters, he said. "We try to go with the cases that are more life-threatening situations, and you try to put off things that we can do later and try to do things that are more urgent. But sometimes it's difficult," he said. "You do feel helpless. You wish you can do more." Restituyo said he will do what he can for the next few days, trying to stay emotionally sound amid the devastation while he continues his humanitarian missions. "People are trying to cope. People are lost. They don't know what to do. They don't know where to go, for the most part," he said. "Just emotionally, it's tough. "It's hard to believe from yesterday to today everything that has changed."